What would you do if the death of your soul mate…meant the birth of your dream? 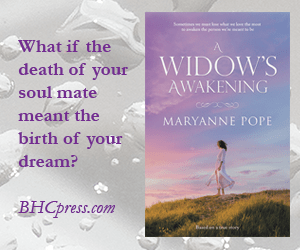 A Widow’s Awakening is a candid exploration of the ‘waking up’ of a woman’s soul to the realization that her husband’s death has given her the financial gift of freedom to pursue her life-long dream of becoming a writer. But with freedom comes responsibility – for hidden in the greatest tragedies lies the potential for the greatest change. Please click here for more reader testimonials about the spiritual journey of A Widow’s Awakening. To listen to a short audio clip from A Widow’s Awakening that pertains to Maryanne’s spiritual journey, click here. “Clunk goes the Coin. Soulmates are opposite sides of the same coin. I truly loved reading this book. It was sad but also enlightening…I enjoyed reading about the spiritual side of this story…the red light as referring to his soul; the earth, air, fire, and water elements; the stars in the universe; all uniquely genius.